There's a bit of a buzz in the air in San Antonio, Texas. For there, Toyota Motor Manufacturing Texas (TMMT) has a strategy to ramp up pick-up truck production. Toyota Motor Manufacturing Texas is seeking production line workers to start work on 25 September on one of two shifts: the 6.30am to 5.30pm shift or the 6.30pm to 5.30 am shift. One rate is given as $10.25 an hour plus overtime and employees must speak English. But there’s a buzz in the air at TMMT for another reason. Because the talk of expansion and new jobs suggests the 2016 Tundra could be about to appear with a new diesel. Way back in February 2014, wardsauto.com suggested Toyota’s Tundra pick-up would be gettig a new engine. Not an in-house diesel but one from Cummins Inc.
WardsAuto forecast the new engine in the Tundra would be the ISV5 5-litre V8 turbodiesel from Cummins and this would debut in the next generation Tundra set to bow in 2016. This is a version of the same engine that Nissan is using in its Titan full-size pick-up truck. The engine’s principal engineering feature from Cummins’ viewpoint is the use of a compacted graphite iron (CGI) cylinder block – a similar material is extensively used by Ford, including its 6.7-litre V8 Power Stroke engine built in Chihuahua, Mexico. VM Motori also uses the same material in the V6 engine fitted to the Fiat Chrysler Ram 1500. Just how different the Tundra version of the Cummins engine will be, remains to be seen. It might be expected that Toyota will want to be able to claim at least one feature unique to its Tundra brand to differentiate it from the Titan’s Cummins diesel. Will the engine produce more than the 300 bhp and 500 lbft. (678 Nm) performance of the engine in the Nissan truck? WardsAuto thought at the time that the global economic downturn caused Toyota’s in-house project to be shelved. The rumour mill had the ‘new’ diesel to be the result of a collaboration with Toyota’s Hino heavy-truck subsidiary. An in-house diesel at that time likely could have caused a double whammy: relatively low sales volumes compared with less-expensive gasoline engines and high development and certification costs. Hence Toyota came knocking on Cummins door – Cummins being the only sensible engine maker the Japanese automaker could reasonably go to – both Ford and General Motors could be ruled out and Navistar would be a non-starter. However, more-stringent US CAFE regulations calling all automakers to meet a fleet target of 54.5 mile/gal (4.3 litres/100 km) by 2025, could mean that Toyota’s in-house diesel is now on the cards for the Tundra – indeed it is seen by some as a necessity, even though it would require completely new homologation. Clearly, Toyota executives will be watching very carefully indeed to see how the Cummins power unit is received especially as reflected in sales of the Tundra. In the meantime they are monitoring the progress of the Titan. If the Cummins diesel proves popular and does wins sales, then it could prompt Toyota to reinstate its own diesel project. On the other hand, this may be already in hand. In which case Toyota executives may not worry too much if their version of the ISV5 is identical to that which Nissan takes. To some extent, Toyota has the whip hand. Executives of the Japanese company know that Cummins desperately needs a second customer for the engine to help justify investment in R&D and manufacturing plant. Meanwhile, pick-up truck sales in North America are doing much better than this time last year following production and product investment. Since Toyota produces both the midsize Tacoma and half-ton Tundra at the same plant in San Antonio, it has an opportunity to increase production of both trucks from a single plant investment. To accomplish this, Toyota is adding 275 people to the TMMT assembly plant by the summer of 2016. TMMT is moving to a six-day production work pattern when it starts a permanent Saturday shift beginning during the second quarter of 2016. Some sources suggests workers will get over $14 an hour. According to a spokesperson for Toyota, strong pick-up truck demand is the reason it will add employees and invest $26 million to improve the production facility. That will allow Toyota to implement a new work schedule designed to add tens of thousands of new pickup trucks to its year-end totals, maybe 50,000. In terms of overall US pick-up truck sales this is minute, but to Toyota every sale is a sale. 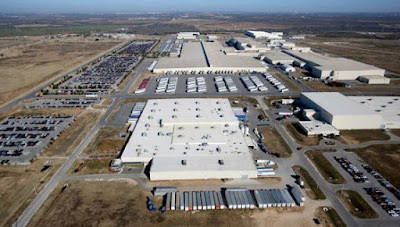 The size alone of the San Antonio plant is confirmation enough that Toyota is no fly-by-night. Indeed, sales of the Tacoma and Tundra trucks have been on the rise over the past several years - especially the Tacoma, which has had double-digit sales increases every month since December. In August, Toyota sold 16,230 Tacoma trucks, up from 14,338 in the same month last year and 12,193 in August 2012, according to company sales reports. After production of the Toyota Tacoma moved to the San Antonio plant in 2010, the plant was able to produce up to 200,000 vehicles a year without overtime or Saturday production. However, in the last two years the plant has produced around 230,000 pick-ups a year through overtime and some Saturday production. This latest investment in people and plant upgrades, which will include a six-day work week (Monday through Saturday), should add some 50,000 additional pickups a year to total capacity, putting the plant's potential maximum capacity close to 275,000 trucks. San Antonio's TMMT assembly plant employment already stands at a record 3,000 and 23 suppliers situated around the confines of the assembly plant collectively account for another 3,100. With the anticipated increase in Toyota’s own production it is expected that at least some of the 23 suppliers will increase their own workforces to keep up pace. Toyota budgeted $26 million would cover the increased payroll and the new tooling and equipment, according to a spokesman for Toyota Motor Engineering & Manufacturing North America. Last year, the plant produced 236,000 Tundra and Tacoma pickup truck models - sometimes relying on overtime. Production for all of 2015 may exceed that number as at present, according to Toyota people, the plant cannot meet demand. The plant has already adopted some Saturday shifts – "planned Saturdays" – to accommodate increased demand or catch up occasional lost time. Officials claim the new work schedule is not in anticipation of this month's launch of the 2016 Tacoma - the brand's first major redesign in a decade. Toyota makes Tacoma pick-ups elsewhere in Mexico. In February 2014, Toyota Motor Manufacturing announced that in order to meet demand that year, it would invest $11 million and add 70 more employees to the 1,100 employee base. Toyota´s Baja California facility is located in Tijuana, south from San Diego, California. To give some insight, this operation produced 59,000 Tacoma pick-up trucks and 200,000 pick-up truck beds in 2013. With that expansion Toyota increased in capacity to 63,000 Tacoma units a year. Since its 2004 initial production of 30,000 Tacoma trucks Toyota’s production capabilities, the company have increased 210 per cent in the last ten years. IHS Automotive has projected that by 2020 Mexico will have the capacity to build one in every four vehicles in North America. According to Bloomberg, Mexico’s automotive industry has quadrupled its exports to the US. During the last 10 years, in 2014 was expected to reach 1.69 million cars, making it the second largest behind Canada, surpassing Japan. And there is a possibility that by 2015 Mexico could also pass Canada in auto exports to US. Mexico’s automotive industry growth has also attracted producers of automotive components, increasing its local supplier base. Tijuana has one of the largest base of automotive parts and services suppliers, over 40 companies manufacture a wide range of parts from electronic components to seatbelts and sound speakers, taking advantage of the city´s strategic location, with fast access to US and Mexico´s markets. Earlier this year, Toyota added a third shift to its plant in Tijuana, Mexico, to build more Tacoma trucks in response to consumer demand. The company planned to hire 300 workers at that site in order to build an extra 13,000 trucks for its US dealerships. Proof that Toyota sets great store by Mexico materialised in April this year, when it announced a $1 billion investment plan to build the new 2020 Corolla compact car. A combination of the seemingly low cost of doing business in Mexico, a strong regional supplier base and a new Toyota architecture called TGNA are three of the reasons given that will make the 2020 Corolla more competitive. The 2020 Corolla is already being signalled as a “radical” new car. Will it set a benchmark? TGNA deals with the basic materials and methods used to build the car’s chassis and body and will give a lower centre of gravity, and better ride and hand handing, lighter weight and improved fuel economy, according to executives. Some observers tend to write off Toyota, especially when it comes to making pick-up trucks. But the company has achieved resounding success across the board from a business perspective. The sheer size and scale if the TMMT plant (above) shows Toyota iis serious about building good vehicles. Added to which, following the Second World War, Toyota led the world’s automotive manufacturers in developing new techniques for improving quality, raising the standard among the supply base and reducing manufacturing cost, all of which for many years set the benchmark that others had no choice but to follow. Indeed it took some many years to catch up. The new plant in Guanajuato in Central Mexico begins production in 2019 and will have a capacity of 200,000 units a year. When the plant is running it will be able to export to North America and other parts of the world. Just as important for Toyota’s plant executives will be their ability to carry out direct cost comparisons with their plant in Blue Spring, Mississippi. Though, of course executives already have a good idea of these comparisons. It would be interesting to know whether, during the original negotiations between Cummins and Nissan over the supply of the V8 diesel for the Titan, the question of exclusivity arose. It surely must have done, because Nissan would not have welcomed the idea - to put it mildly - of Cummins subsequently to supply the same basic engine to a direct competitor such as Toyota. My guess is that Nissan sacrificed its exclusive use of the engine in return for a reduced unit price.